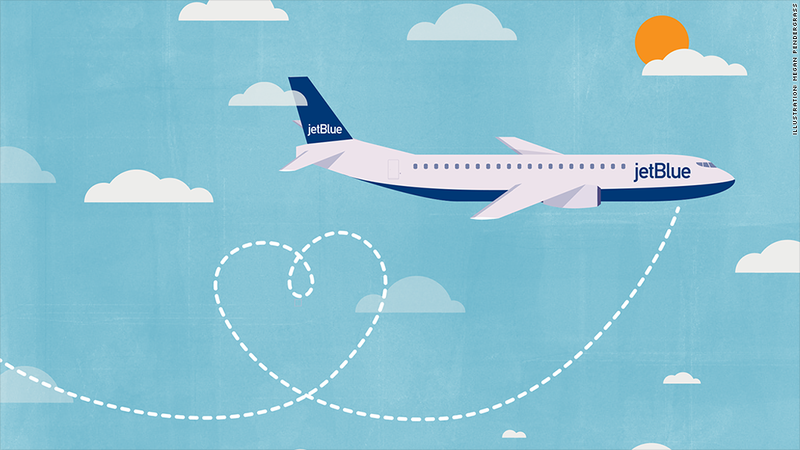 JetBlue (JBLU) is offering to fly two police officers from each department on its route around the country to New York for the funerals of two NYPD officers killed last weekend. The New York-based airline is also working with its partners to have family members of one of the slain officers, Wenjian Liu, flown in from overseas. Liu and a second NYPD officer, Rafael Ramos, were sitting in their patrol car when they were shot and killed by Ismaaiyl Brinsley, a Georgia man with a long criminal record. A spokeswoman said JetBlue has provided similar support in the past, but did not immediately provide any details. The gesture was a positive one at a time when tensions have been running high nationwide in the wake of two recent incidents involving the death of unarmed black men at the hands of police in Missouri and New York. The NYPD's 25th Precinct in Manhattan thanked JetBlue on Twitter for "offering free flights to NYC for any police officer in America who wants to attend Officer Ramos' funeral on Saturday."